Imagine what would happen if all the computers in an office crashed. Mayhem and mass confusion would break loose. The office would cease to function technology. 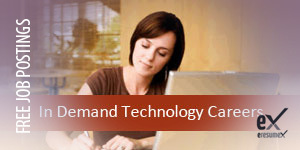 Technology support is essential for almost all businesses today. Whether the office has an in-house information technology (IT) department, or uses a freelance company, the need for someone to manage, regulate and troubleshoot the computer systems remains. Although many of these majors can be pursued with a certificate or associates degree, administrative IT jobs typically require a bachelors degree in software engineering, mathematics, computer science, information technology or management information systems. If you’re looking for a quicker route to a job in technology, enroll in a career college or community college to earn a certificate in desktop support. When you’re ready, EresumeX can help you find the Technology job you are looking for.